Dearborn Firefighters who shared stories of how former Rep. John Dingell often visited their firehouse and thanked them for serving the community honored him with crossed ladders. The hearse transporting the nation’s longest serving Congressman drove under the American Flag hanging form their ladders as it arrived at the Church of the Divine Child. 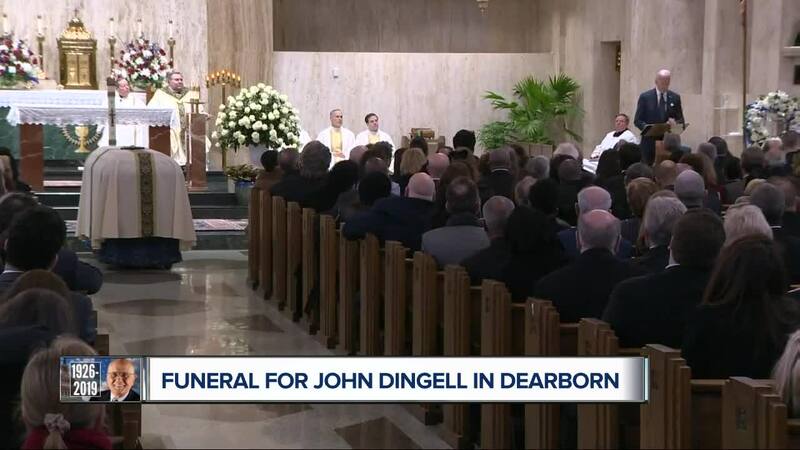 DEARBORN, Mich. (WXYZ) — Dearborn Firefighters who shared stories of how former Rep. John Dingell often visited their firehouse and thanked them for serving the community honored him with crossed ladders. The hearse transporting the nation’s longest serving Congressman drove under the American Flag hanging form their ladders as it arrived at the Church of the Divine Child. As she arrived Rep. Debbie Dingell walked behind her husband’s casket with family members and former Vice President Joe Biden, who delivered the eulogy. “Everything he worked on was rooted in that knowledge and the belief that every single solitary person wanted and deserved to be treated with dignity,” said Biden. The dignity they felt he gave them is why so many in attendance said they felt the need to come to pay respect. One man recalled how the congressman spoke out for Muslim Americans after September eleventh. “He was shielding us in the time of hardship,” said MD Alam, a Muslim American. Others spoke about how his legislation that made Medicaid and Medicare possible saved lives, how the environment is better thanks to him, and how he made them feel they had a voice as Americans. “I’m on Medicaid and that is the only thing that is getting me through,” said William Bird of Garden City. Bird says he worked three part time jobs, but still could not afford the medical care he needs. “It is what is keeping me alive,” said Bird. “I care so much about the environment and he was instrumental in cleaning up the Rouge River,” said Sally Petrella, who says she volunteers with Friends of the Rouge River. “He cared about people he never met, who never crossed his path, but he knew needed help,” said Chris Savage, the Chair of the Washtenaw County Democratic Party.